An earthquake, of magnitude 4.8 on the Richter scale, struck Andalucia at 4.11am this morning prompting calls to the 112 emergency service. Jimena de la Frontera in Cadiz province was the epicentre of the earthquake this morning, although some tremors were felt in Malaga and Sevilla provinces too. Fortunately there are no reports of personal injury or damage. 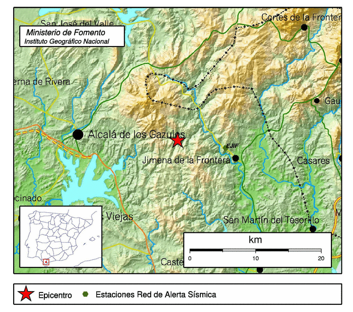 Last Sunday an earthquake of magnitude 3.8 on the Richter scale was recorded northwest of Casares. According to the Instituto Geografico Nacional earthquakes are relatively common on the peninsular with 1,200 earthquakes striking each year, of which only about 20 are actually felt by the population.